In the inaugural episode of "Dishin' Delicious," we visit Marion Street Market to sample a signature dish: crab-crusted walleye with green garlic remoulade accompanied by salt and vinegar potato salad. Marion Street's Chef Bret Bohning uses fresh ingredients from local producers, like micro shiso from nearby hydroponic farm Urban Till. 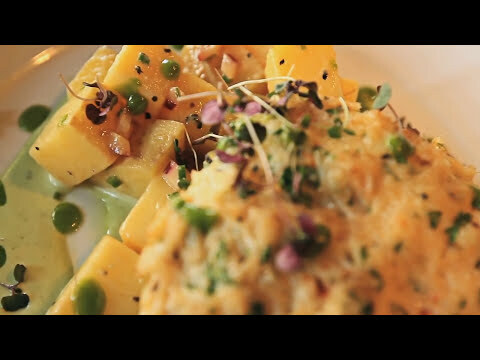 Check out the video below to find out more about this delicious dish! At Marion Street Market we celebrate culinary creativity every day. Join us for upscale casual dining in our Bistro or shop the Market for artisan and farmstead cheeses, charcuterie, gourmet goodies, wines, beers, spirits, and more. Marion Street Market is located at 100 South Marion Street in Oak Park. Contact us at 708.725.7200 or marionstreetmarket.com. As a life-long foodie and resident Oak Parker, I'm excited to tell you about the many interesting culinary experiences that my hometown has to offer in the new Village of Oak Park series "Dishin' Delicious." You may have seen me around town writing about my favorite food -- BACON! -- for the Bacon Quest section of Fall Food & Fun for Wednesday Journal publishing in print on September 23rd, but I'm taking my food reviews to the big screen with Dishin' Delicious airing on local television Channel 6.